Do you feel low on energy each time you go for a swim? Do you really want to increase your stamina to give your swimming buddies some tough competition? Well, boosting swimming endurance is not an overnight affair. You need to have patience and practice to get it right. But don’t worry! We have here some exclusive workouts and a few general tips to enhance your levels of endurance. Read on to know how you can swim better without feeling washed out! Though this chart asks you to start with 700 yards, you can increase the number as you practice other strokes along with it consistently. When it comes to enhancing the stamina for the total body workouts like swimming, cross-training can help a lot in gaining speed faster. You can start practicing any convenient weight workout that is intended for the upper body. All you need is to focus on your torso (core, arms, back, etc) to get ‘sculpted swimmer shoulders’. It involves neither intricate movements nor heavy equipment. Well, swimming strokes are not at all natural moves. So, making use of equipments like keyboard, paddle, fin, drill, etc., can be helpful for you to get accustomed with your strokes. Know about the right positions of your body and alter the swimming techniques as per your needs. 1. Start with an easy warm-up. For this, you need to swim anywhere between 200 and 400 meters at a considerably slow speed. 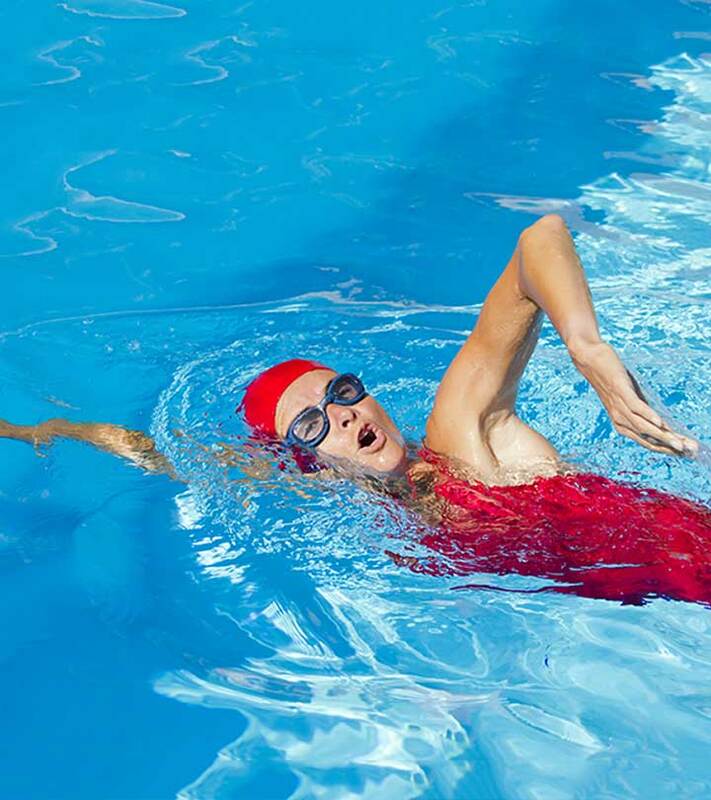 Make sure that you vary your stroke after each 100 meters and take rest as often as required. 2. Now, complete swimming 300 meters in 3 consecutive sets of 100 meters. The speed should be moderate and there is no stroke preference for this. However, you must give yourself a resting time of 10-15 seconds in between the sets. 3. Then, finish swimming another 300 meters. But this time, you need to break it up in 2 sets of 150 meters. The speed during the first set should be moderate. Take rest for 20 seconds once you are done with it. Practice the second set by increasing your speed gradually (every 50 meters) up to 90%. It should be followed by a resting period of 30 seconds. 4. After that, swim 300 meters once more. Maintain a moderate speed during the whole process and try not to take rest. In case, it becomes extremely necessary, give yourself a brief resting time of 5 to 10 seconds only. 5. Finally, cool down your body by swimming the last set of 200 meters. Be as slow as possible this time. If you wish, you can also use fins for this purpose. Have a filling meal containing lots of carbohydrates or grains (like pasta, oatmeal, rice, etc.) around half an hour before swimming. Keep yourself hydrated by drinking plenty of water prior to jumping in the pool. Make sure that you take breaks to drink water as soon as you feel thirsty during the process. Take care of yourself. Practice stretching after each and every swimming session so that the water resistance can’t take a toll on your shoulders and you do not run out of stamina for the next session. hope now you got an idea on how to increase stamina for swimming! Swimming can be therapeutic. And when you swim right, you provide your body a complete workout. But the key here is swimming right! With these tips, you can now build up your swimming stamina, and actually swim like a fish! Was the article helpful? Let us know by commenting below. Does Swimming Aid Weight Loss?